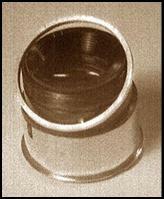 Lens adjustment and helical work require lens disassembly. Taking the Industar apart is easy. 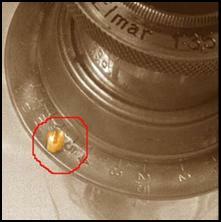 The example shown below is really a „Leitzified“ Industar-50 which came from a fake Luftwaffe Leica. Take out the metal baffle from the rear of the barrel. 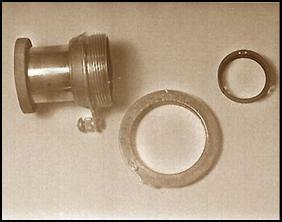 Two locking rings will be found: take out the outer one; the inner one holds the rear elements of the lens. The lens can be removed from its mount by taking out the longer lock screw on the mount face. 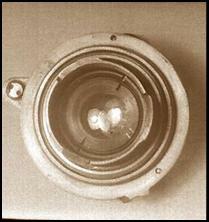 Note the position at which the lens lifts from the mount– this is important during reassembly, to locate where the entry to the helix threads should be. Look for the hole on the side of the lens face ring and take out a teeny-weeny little tiny screw. The lens face can be screwed out by gripping it with a rubber mat. Unscrew the lens counter-clockwise and note the position of the notched distance pointer when the lens barrel comes off. The lens block comes off as entire unit. Metal spacer rings, or shims hold the lens block in correct position relative to the required working distance from the focal plane. The shim can be replaced with a thinner one or more can be added to get the necessary working distance for correct focus. 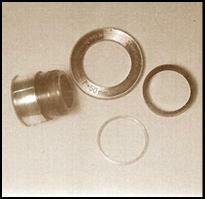 Spacers can be made from paper or wire, and placed inside the lens barrel where the lens block sits. 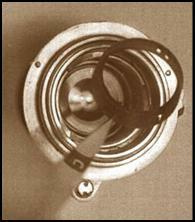 Without a collimator, measuring the working distances would be difficult. A jerry-rig can be made using another camera with an opening back and a ground glass. A very distant image focused on the groundglass can be observed and basis of how much to raise or lower the lens can be made from this. 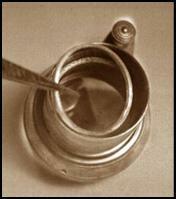 To ease up stiff focusing, the old lubrication can be removed from the focus helicals with lighter fluid. Pesky dried old grease can be totally removed with petrol, as many older service manuals suggest, but this is DANGEROUS. New lubrication can be applied once the old one has been cleaned off. Choose one which stays in place, and does not melt during hot weather. I’ve been using „Super Lube“ (Synco Co.), a teflon-loaded synthetic clear grease for this purpose. To put back lens, line up the notched focus index between the “1,7- and 2-” metre marks on the scale. 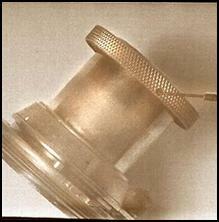 Find where the threads meet and screw the lens back in. This usually works with I-22 /50.